Treadmill desks are an effective machine for exercising in the office. 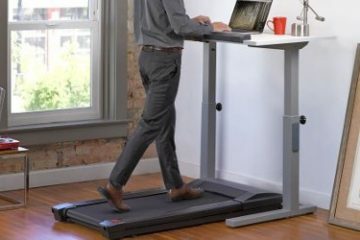 Many people work long hours and don’t have the time to workout or go to the gym, fortunately, with a treadmill desk, you can do light walking while you work. Most treadmill desks allow the user to walk between 1 and 4 mph, burning calories and keeping your muscles active throughout the day. A fixed treadmill desk is one where the desk section is connected to the base. These desks are designed with only one purpose and that is for light walking while at work. Many people like the ease of having only one unit, and often these products are cheaper than having a separate base and height adjustable desk. Under desk treadmill bases are separate units from the desk. 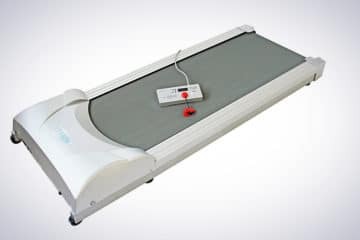 These look like a traditional treadmill, just stripped of the arms and main console, instead of using a smaller console which can be placed on your desk. A treadmill base is perfect for people who already have a height adjustable desk and who want a treadmill to slide in and out from under the desk whenever they need a workout.